ESTRO, Barcelona, Spain · 2018, Le Tourneau C. et al. With recent advances in radiation delivery techniques, an increasing number of cancer patients undergo radiotherapy. However, due to the non-targeted nature of radiotherapy, doses are limited by potential toxicity to surrounding normal tissue. Thus, a major challenge remains to develop new strategies to improve the tumor selectivity of radiation therapy. 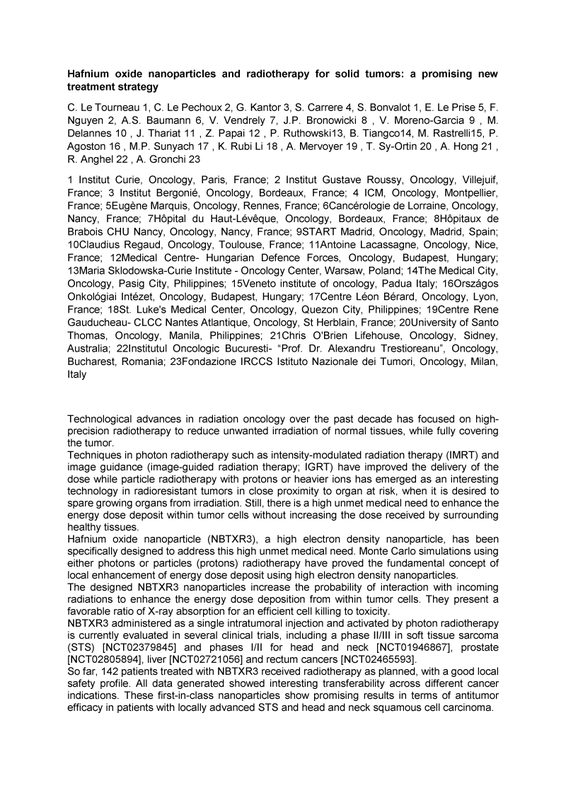 Nanobiotix has developed NBTXR3 – a hafnium oxide nanoparticle that can enter tumor cells and deposit high levels of energy in cells when exposed to ionizing radiation thereby increasing tumor-specific physical killing through DNA damage/cell destruction and enhancing the intratumoral immune profile. At 2018 ESTRO, an overview of NBTXR3 was presented, describing its role in current 7 clinical trials.